This "Unicorn Captive and Unicorn Hunt" shows a scene from the Hunt of the Unicorn series of tapestries. The original was thought to be commissioned for a wedding between King Louis XII and Anne of Brittany. In this scene we see the resurrected unicorn held captive in a pen, approached by royal hunters who pursued the creature to finally capture and kill it. However, miraculously, the unicorn became alive again in this scene. The characteristic medieval styled backdrop to the foreground is mille-fleur or thousand flower, showing the flora and fauna of the wild to decorate the entire scene with color and pattern. 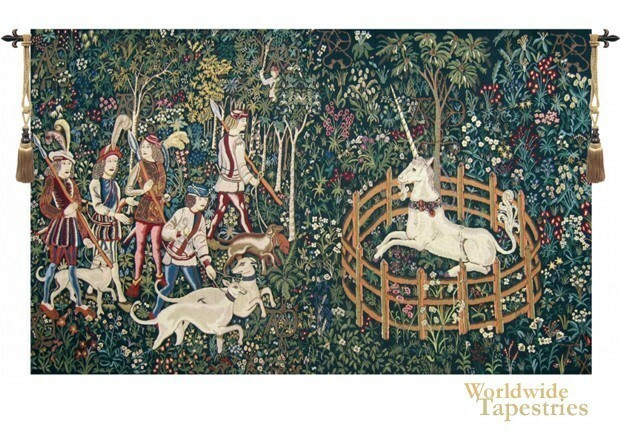 This unicorn art tapestry "Unicorn Captive and Unicorn Hunt" is backed with lining and tunnel for easy hanging. Note: tapestry rod and tassels, where pictured, are purchased separately. See a larger, detailed image of the Unicorn Captive and Unicorn Hunt tapestry here. Dimensions: W 112" x H 68"